After picking up wins Wednesday, Boston University men’s basketball will face off against Elon University and BU women’s basketball will play the University of Delaware Sunday. Both BU basketball teams beat the University of New Hampshire Wednesday. Men’s basketball (4-4) routed UNH (2-5) with a score of 82-53 at Lundholm Gym. Women’s basketball (3-2) had a commanding 60-39 win against UNH (1-6) at Case Gym. BU men’s basketball head coach Joe Jones said he wants to make sure the team remains focused following their win against the Wildcats. Elon (3-4) is coming off of a 92-59 win against Central Penn College (2-3). The Phoenix fell victim to three straight losses before the Central Penn victory. Senior guard Steven Santa Ana tallied 18 points, 12 rebounds and five assists in the Central Penn win. Santa Ana became the 43rd player in program history to pass the 1,000 point mark and currently sits at 1,007 points. Santa Ana is currently ranked second in scoring with 94 points and has averaged 13.4 points per game. Leading the Phoenix in scoring is senior forward Tyler Seibring, who has notched 103 points for an average of 14.7 per game. Together, these two players combined have scored 39.7 percent of the team’s total points this season. The Terriers had their own duo of point production in their win against the Wildcats. Junior forward Tyler Scanlon scored 15 points, and sophomore guard Javante McCoy scored 14 points. Amid 2-3 road trip, Jones said he thinks things will get easier for the Terriers once they have a better balance between home and away games. Delaware women’s basketball (3-3) will face BU coming off the Florida Atlantic University Thanksgiving Tournament, where they took a loss against Bradley University (5-0) and a win against Lafayette College (3-3). After losing their first two games this year, the Hens have won three of their last four and have the opportunity to rise above .500 for the first time this season with a win. In their game against Lafayette, the Hens have a trio of double-digit producers. Sophomore guard Justina Mascaro led the team with 14 points, junior guard Bailey Kargo tallied 13 and junior forward Samone DeFreese had 11. 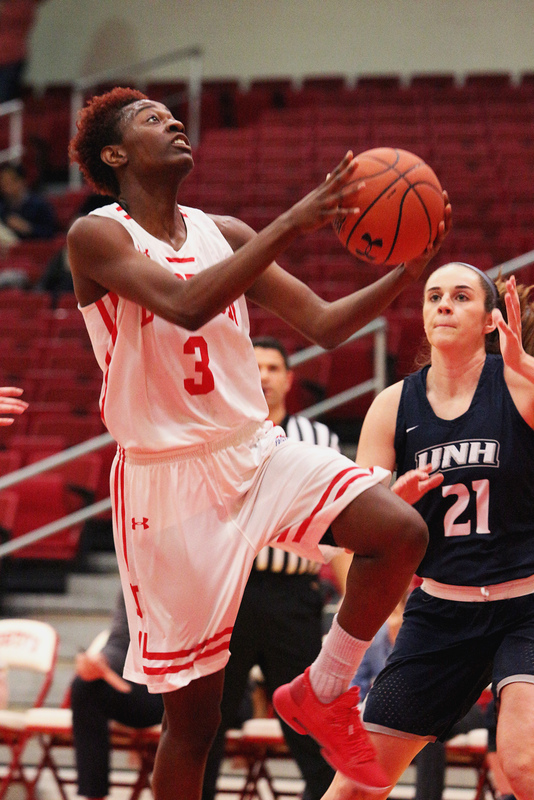 BU women’s basketball had a set of four double-digit producers against the Wildcats. Junior forward Nia Irving dropped 16 points, senior guard Lauren Spearman had 11 and both senior forward Naiyah Thompson and sophomore guard Katie Nelson scored 10. BU women’s basketball head coach Marisa Moseley said she thinks the team will be ready to face the Hens Sunday. Dylan Woods and Ethan Fuller contributed to the reporting of this article.